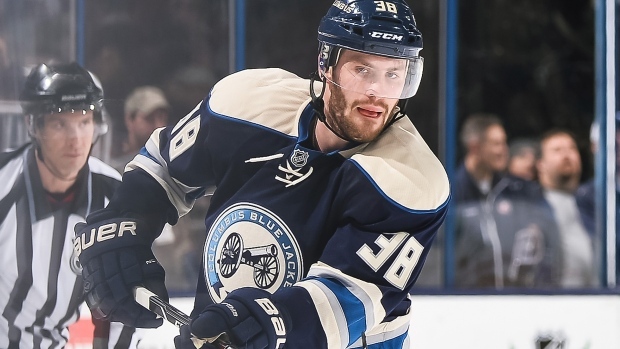 COLUMBUS, Ohio - The Columbus Blue Jackets have activated forwards Boone Jenner and Jeremy Morin off injured reserve and assigned forward Ryan Craig to their American Hockey League affiliate in Springfield, Massachusetts. The 21-year-old Jenner has missed the last 40 games with a stress fracture in his back. He had six goals and six assists in 20 games with the Blue Jackets this season after collecting 16 goals and 13 assists in 72 games last year. The 23-year-old Morin missed the last 25 games with an upper-body injury. He had a goal and two assists in 17 games with the Blue Jackets after being acquired by the club on Dec. 14 from Chicago in a trade. Craig, a veteran with 198 career NHL games, made his Columbus debut on Wednesday at Edmonton.